Once you’ve conceded that not all clients are equal, the question is — which of your current or prospective clients are the best fit for your firm? This is a tough exercise. Because the truth is, there are no “ideal” clients. There are good clients, great clients, and almost ideal clients. But no client is perfect. The goal here is to attract better clients. The ones who are as close to your ideal client profile as possible. But to do that, you need to know what your ideal client looks like first. 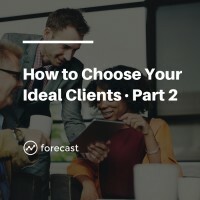 In this lesson, we’ll explore four criteria that you can use to identify your ideal client profile.